Since we all breathe, what could be more natural? What could be more absurd than studying how to breathe? In fact, correct healthy breathing is rare. Health problems due to faulty breathing are common and well-documented in the medical literature. Incorrect ("paradoxical") breathing can actually strain muscles of the neck and torso. These, in turn, entrap nerves producing such side effects as dizziness and headaches, chest and arm pain, or numb fingers. Breath control is considered so basic in disciplines from singing to yoga to martial arts, that it is studied formally — what can you possibly control if you can't control your own breathing? Breathing exercises can be used for relaxation, autosuggestion, and the formation or modification of habits and behavior. Because breathing is automatic, semi-automatic, and unconscious, it is considered as a bridge to the subconscious and unconscious levels of mind. This bridge can be used to internalize the concepts and sensations developed during ki testing. Oxygen is a nutrient. Ki breathing allows you to take in more oxygen and expel more carbon dioxide than is possible during incorrect or even normal breathing. It improves mind and body coordination, increases energy, and enhances confidence. It can even provide such unlikely benefits as improved eyesight1. 1. Deep breathing Is an old astronomer's trick that enables the eye to see fainter stars than are normally detectable by the unaided (or oxygen-depleted) eye. diaphragm more than other positions. Be comfortable (although not to the point of collapse or drowsiness). The point of ki breathing practice is breathing — not overcoming physical discomfort by sheer iron will and grim determination. The standard perception of breathing found throughout the martial arts is that exhalation is "strong" and inhalation is "weak." 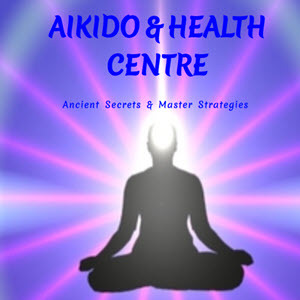 This is one of the reasons for the powerful exhalation of breath and piercing sound of kiai. 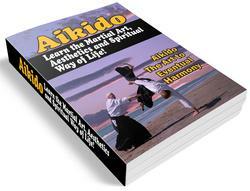 Aikido, as usual, sees things a bit differently and strives for strength and power at all points in the cycle of breath. Begin by observing your breathing as it is now. The inward and outward flow of air. The feel of air in your nostrils, in your mouth and throat; the sound and sensation it makes in your head and chest. How far a breath goes down inside your body. Whether you can pay attention to your breathing and still let it operate automatically. Any tendency towards partial, incomplete, skipped, or forced breaths. The amount of time you can extend an exhalation or an inhalation. The amount of time you can hold a breath. That you can inhale or exhale at will; that you can "hold your breath" with lungs full, partly full, or empty. Notice also that you must eventually resume breathing whether you want to or not. Rather than fighting that mechanism, use it to learn that volition is best seen as "latitude within limits."